The unmoved mover (Ancient Greek: ὃ οὐ κινούμενος κινεῖ, ho ou kinoúmenos kineî, "that which moves without being moved") or prime mover (Latin: primum movens) is a henotheistic concept advanced by Aristotle, a polytheist, as a primary cause or "mover" of all the motion in the universe. As is implicit in the name, the "unmoved mover" moves other things, but is not itself moved by any prior action. In Book 12 (Greek "Λ") of his Metaphysics, Aristotle describes the unmoved mover as being perfectly beautiful, indivisible, and contemplating only the perfect contemplation: itself contemplating. He equates this concept also with the Active Intellect. This Aristotelian concept had its roots in cosmological speculations of the earliest Greek "Pre-Socratic" philosophers and became highly influential and widely drawn upon in medieval philosophy and theology. St. Thomas Aquinas, for example, elaborated on the Unmoved Mover in the Quinque viae. These issues are sharpened by the objection that in the natural cases at least teleological and material-efficient explanations are actually incompatible. The objection goes as follows. Suppose some explanandum E, and a set of conditions C which account for E mechanistically. It is then reasonable to suppose that the instantiation of C necessitates E. Now take some supposed final cause F: if it is going to be even part of the explanation of E, it should be at least a necessary condition of E. But the only way for that to be true compatibly with C's necessitating E is if F is at least necessary for C as well. But how can final causes be necessary for the material instantiation of the mechanistic causes of things? Final causes, then, are parts of reality in the sense that the drive for form that they represent is written directly into the structure of things. They are not ghostly, as-yet unrealized objects exercising a mysterious a fronte causal power: rather they are the forward-looking elements of the incipient structure of organisms, a structure whose real existence allows Aristotle to reject the view that the Universe is controlled by the providential hand of a beneficent deity without thereby reducing it to what he at least sees as the absurd randomness of the pure mechanists (cf. VI.1d). Aristotle argues at the opening of Physics bk. 8 that motion and change in the universe can have no beginning, because the occurrence of change presupposes a previous process of change. With this argument Aristotle can establish an eternal chain of motions and refute those who hold that there could have been a previous stationary state of the universe. 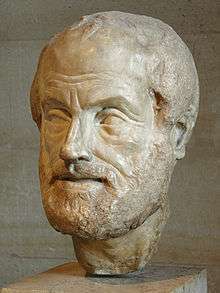 Such an eternal chain, Aristotle argues, needs to rely on a cause which guarantees its persistence: if each of the constitutive processes in the causally connected web were of finite duration, for every one of them it can be the case that it is not present in the world, indeed, at some later time it will not be present any longer. But then the whole causally connected series of events, Aristotle submits, would also be contingent. Hence Aristotle postulates that the processes of the universe depend on an eternal motion (or on several eternal motions), the eternal revolution of the heavenly spheres, which in turn is dependent on one or several unmoved movers (Physics 8.6, 258b26-259a9). The priority of the eternal celestial revolutions, furthermore, guarantees the causal finitude of the universe. This is so, even though there are infinite causal chains: behind every single individual of an animal species there is an infinite series of male ancestors, each causally responsible for the subsequent members in the series, because Aristotelian species are eternal and male parents are the efficient causes of their offspring. Left to its own devices, the finite universe on its own would swiftly reach a dissolution, a state of complete separation of the elemental masses into their concentrically arranged natural places. In view of the fact that such a complete segregation of the elemental masses is avoided through the constant excitation caused by the celestial motions, producing heat in the sublunary domain, especially around the regions of the Sun, Aristotle will be entitled to assert that the cause of the human being is in the first instance his or her father, but is at the same time the Sun as it moves along its annual ecliptic path. Between celestial revolutions and the individual natural processes there is always a finite causal chain, as these natural processes could not possibly have continued without the celestial motions. The infinite causal chains passing through male parents cannot subsist on their own without this constant external support, and this dependence can always be analysed in terms of finite causal chains. Aristotle begins by describing substance, of which he says there are three types: the sensible, which is subdivided into the perishable, which belongs to physics, and the eternal, which belongs to "another science." He notes that sensible substance is changeable and that there are several types of change, including quality and quantity, generation and destruction, increase and diminution, alteration, and motion. Change occurs when one given state becomes something contrary to it: that is to say, what exists potentially comes to exist actually. (See Potentiality and actuality.) Therefore, "a thing [can come to be], incidentally, out of that which is not, [and] also all things come to be out of that which is, but is potentially, and is not actually." That by which something is changed is the mover, that which is changed is the matter, and that into which it is changed is the form. Substance is necessarily composed of different elements. The proof for this is that there are things which are different from each other and that all things are composed of elements. Since elements combine to form composite substances, and because these substances differ from each other, there must be different elements: in other words, "b or a cannot be the same as ba." Near the end of Metaphysics, Book Λ, Aristotle introduces a surprising question, asking "whether we have to suppose one such [mover] or more than one, and if the latter, how many." Aristotle concludes that the number of all the movers equals the number of separate movements, and we can determine these by considering the mathematical science most akin to philosophy, i.e., astronomy. Although the mathematicians differ on the number of movements, Aristotle considers that the number of spheres would be 47 or 55. Nonetheless, he concludes his Metaphysics, Book Λ, with a quotation from the Iliad: "The rule of many is not good; one ruler let there be." ↑ "The Definition of 'Pagan': Monotheism and Polytheism". PANTHEON. ↑ "Aristotle's Natural Philosophy: Movers and Unmoved Mover". stanford.edu. ↑ Shields, Christopher John (2007). Aristotle (reprint ed.). Taylor & Francis. p. 187. ISBN 978-0-415-28331-1. ↑ Shields, Christopher John (2007). Aristotle. pp. 196, 226. 1 2 Ross, Sir David; Ackrill, John Lloyd (2004). Aristotle (6th ed., revised ed.). Psychology Press. pp. 188, 190. ISBN 978-0-415-32857-9. ↑ Graham, D.W. (1999). Physics. Clarendon Aristotle Series. Oxford University Press, USA. p. 179. ISBN 9780198240921. LCCN 98049448. ↑ Humphrey, P. (2007). Metaphysics of Mind: Hylomorphism and Eternality in Aristotle and Hegel. State University of New York at Stony Brook. p. 71. ISBN 9780549806714. The universe has no beginning in time, no temporal first cause, so Aristotle is obviously not seeking an efficient cause in the sense of "what set it all off?" Aristotle's unmoved mover acts as final cause, as the good toward which all things strive. That is, it acts an objects of desire: "The object of desire and the object of thought move without being moved" (Met., 1072a26–27). ↑ Hankinson, R. J. (1997). 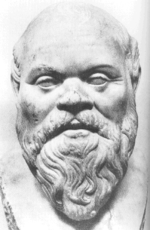 Cause and Explanation in Ancient Greek Thought (PDF). Oxford University Press. p.125 (PDF p. 103). ↑ Ross, Sir David; Ackrill, John Lloyd (2004). Aristotle. p. 187. 1 2 Shields, Christopher John (2007). Aristotle. p. 121. ↑ Aristotle (J.L. Stocks trans.) (7 January 2009). "De Caelo" [On the Heavens]. The Internet Classics Archive. I.9, 279 a17–30. ↑ "Cosmological Argument for the Existence of God", in Macmillan Encyclopedia of Philosophy (1967), Vol. 2, p. 233ff. ↑ Aristotle, Physics VIII 6, 258 b26-259 a9. ↑ Now understood as the Earth's rotation. ↑ Aristotle, Physics VIII, 4–6. ↑ Brentano, F.C. ; George, R.; Chisholm, R.M. (1978). Aristotle and His World View. University of California Press. p. 56. ISBN 9780520033900. LCCN lc76050245. ↑ Aristotle, De Caelo Book I Chapter 10 280a6. ↑ Aristotle, Physics Book VIII 251–253. ↑ Shields, Christopher John (2007). Aristotle (reprint ed.). Taylor & Francis. p. 222. ISBN 978-0-415-28331-1. ↑ Ross, Sir David; Ackrill, John Lloyd (2004). Aristotle. p. 186. ↑ The outermost celestial sphere, for Aristotle, the sphere of fixed stars. ↑ Iliad, ii, 204; quoted in Aristotle, Metaphysics, 1076a5. ↑ Harry A. Wolfson, "The Plurality of Immovable Movers in Aristotle and Averroës," Harvard Studies in Classical Philology, 63 (1958): 233-253.